Subtitle: Louise’s PhD uses (Wo)Man With Mirror as a case study for performance-dependent heritage and things that need passing on from person-to-person; why we involved an anthropologist; why this blog post is/is not a record. At the Urambi Village Community Centre, Saturday 19 March 2016. 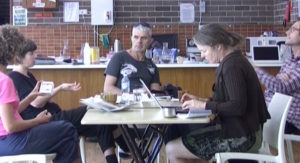 Left to right: Louise Curham (Teaching and Learning Cinema), Laura Hindmarsh (artist), Peter Humble (cinematographer), Diana Glazebrook (foreground, anthropologist), Lucas Ihlein (Teaching and Learning Cinema). In this picture, Teaching and Learning Cinema and colleagues are gathered in Canberra to work with visiting artist Laura Hindmarsh to ‘use’ Teaching and Learning Cinema’s (Wo)Man With Mirror user’s manual. We will spend the next two days getting to the point where we’ve shot Laura’s film. A few weekends later, we’ll work with Laura as she puts together a performance using the film. Today (the day I’m writing) is 5 January 2017 and much time has passed since we did this work. Ever since, my head has been consumed with this work as TLC’s work with (Wo)Man With Mirror is the case study for my PhD (Aug 2014 -). In my research, I’m using (Wo)Man With Mirror to make the case that we expect too much of the archive. The archive alone can’t be expected to keep everything for us in ways we are likely to want in the future­–we also need people to pass things on from one person to the next. Unscaleable, impractical? Perhaps. But possibly also true and that’s what I’m thinking about. Take for example, Man With Mirror (Guy Sherwin, 1976- ) which (Wo)Man With Mirror emerges from: in the archive could be video documentation of Guy’s performances, Guy’s super 8 film (or a 16mm copy as EYE Film Museum in Amsterdam did make), even a super 8 projector for posterity. There could be flyers, reviews, letters and emails between Guy and curators about it (Lucas recently trawled the British Artists Film & Video Study Collection for Man With Mirror, showing us there is some stuff about it but not a huge amount ). How to make sense of all this? For TLC, we found direct ‘tuition’ from Guy incredibly important. Why am I happy to spend three years (duration of the PhD) thinking about this? I earn my living as an archivist and we archivists find ourselves so often ignored, sidelined–let’s face it, contemporary culture loves ‘the archive’ but the average punter prefers to go around archivists because the quiet, patient, thorough, bottom-line work archivists do to ensure records can be used as evidence doesn’t seem to meet the average punter’s expectations. Evidential properties? What does the average punter care for that? Well if your granddad was a member of the Stolen Generation and there are records about his life in institutional care, you probably care an enormous amount. But let’s take for example the government webpage I consulted last week. It’s different today, but lucky for me Archive.org will do the trick thanks and I don’t need an archivist for that (of course, the archivist in mean retaliates, yes it might be there today but in 20 years? To which the user in me replies I got what I need and I don’t really care how I got it). And what about when the work comes together only in the moment in which I experience it? Man With Mirror is an example of that. Sure, we can watch a performance on YouTube and that gives us some kind of contact with the work but you check it, as alluded to above, it’s quite hard to decode what is actually going on. And those present around the table in the picture above would say the experience of it in the flesh is entirely different. So here we are in this picture on the morning of Saturday 19 March 2016, exploring body-to-body transmission. And from a PhD research point-of-view, I’m framing this case as a kind of heritage object–one that is performance-dependent. I’m hoping I can shed light on how we think about the archive and I’m hoping I get a better understanding of how I can use my two fields of expertise, which I’m describing as creative use of obsolete media and the archives. Around the table in the photo, you see Louise, Laura, Lucas, cinematographer/filmmaker/musician Peter Humble and anthropologist Diana Glazebrook. Peter is there to shoot the super 8 for Laura’s film and I commissioned Diana to be here to observe Teaching and Learning Cinema at work. She is taking field notes for a ‘micro’ ethnography. There is more to the story of Pete’s presence and also to Di’s – Pete’s story comes out in the next blog post, we’ll get back to Di’s soon. Louise: the purposefulness then, you’ve got to be purposeful about carrying it out but it’s then about the mapping of what is purposeful for you. And to me that is the bit that’s different, and maybe it’s not front of mind for everybody … we’re [Teaching and Learning Cinema] trying to be as procedural as possible [when we work on a re-enactment]. Laura: Because that’s what TLC is and it’s like drawing on your history as an archivist [referring to Louise] and your engagement with like disseminating work in a sort of pedagogical way, opening up practice in an educative way [referring to Lucas]. And then my role, coming in not as a TLC person–we briefly touched on this in Wollongong–just how I often work with other people’s work but as reference point to create a procedure, task, which I then stray away from, or the process takes me away from. The work has some connection back to someone like Yvonne Rainer or Boltanski [Laura has made past works that involve repetitions or iterations of works by these artists] but it’s a very … it’s like the seed’s sown and then I use that as my excuse to make a work, or the subject of my work and it strays quite far from it. So this has the potential to do that, to stray really far from Man With Mirror because my interests in recreating work are different to yours. Louise: We’re exactly aligned there. Laura: –and I feel like whilst we’re here in March/April, that’s sort of what our aim is. In April I’ll perform the work as TLC intends it but when I come back in November, there’s this potential for it to be my version of it. Peter: It’s also the nature of the way the work has to come together because there is sort of these two aspects as well. We have to make the work, which is performative in its own right but then there is this whole other aspect where you then take the performance into another performance which is sort of quite unusual. Lucas: I think it can be multiple things at once. Like you say, the outcomes of this could suit multiple agendas. Laura: Hence the multiple recording devices, surveillance! Louise: … but it’s interesting, that thing. I love the purposeful–I find that such a useful word. Because I got really a bit confused by those talks up in Brisbane about [at a 2015 art history conference], kind of how long is a piece of string in terms of what is authentic. You know, authenticity and does it matter and in the end to me, that word, purposefulness is so useful because it kind of then just brings it back to the individual person and their individual context and purposeful means different things in different settings. Lucas: And I think that’s right. And to connect to what Laura was saying about having to make it your own, we did that as well. Although this sticks fairly closely to the original at least in terms of digging up, codifying and then following the original choreography, the motivation for doing this comes from our own desire rather than a sort of sense of duty or responsibility to someone else’s desire … First things first, what we can discover from being as close as possible? Lou opens her user’s manual in half, reading while Lucas talks about what can be discovered through being ‘as close as possible’. Why was Di there? As part of my PhD, supervisor Ross Gibson suggested I ‘triangulate’ my data by commissioning an ethnography. Di’s expertise is in West Papuan refugee communities and she is the managing editor of the Asia Pacific Journal of Anthropology at the ANU (lucky Canberrans – all these clever people just around the corner … ) One of the many conferences I attended this year was a symposium organised by the University of Sydney performance studies folks called Scenes of the Real, a most rewarding couple of days for me. This audience included those with backgrounds in anthropology and practices around performance ethnography. They were alarmed that I chose to work with Di who had no expertise in arts anthropology and they found the whole notion of ‘ethnography’ problematic due to the short time frame. However, some of them also loved the ‘wrongness’ of this approach, the ‘just-do-it’-ness. At the time I gave this talk, my point was that we’d commissioned this ethnography, weirdly returning ourselves back from what the body knows to what is empirically observable, I called it reinscribing the archive. Yet at the time Di gave me the notes, I could make little sense of what they contributed. My initial motivation to involve Di was to help with the problem that I am deeply embedded in the case of (Wo)Man With Mirror. By embedded I mean that I am part of the work of (Wo)Man With Mirror and it is also central to my research. The research lingo calls this being an ‘embedded researcher’ and a downside of that position is that the embedded researcher’s observations can be written-off as too subjective. The research model I’m working with makes a plus of my embeddedness and the fact that this research focuses on my own practice but nonetheless, having ways to say ‘this is actually what happened’ are useful. From a research point-of-view, that’s the purpose in Diana being there. So now, 10 months later, what do I think Di’s notes contribute? Her notes record our interaction as she observed it, and in what they observe they show up what she thought was significant. For example, she captures body language, at one points she notes my ‘hand on heart’ as I comment on the uncertain future of film stocks and she captures in detail the eating and drinking that goes on. Reflecting on what she captures and what she leaves out, what emerges for me is a scene of hospitality. Now I know this was important to me because I spent some time organising it before that weekend but this is why Di is here, because her external observation captures that, helping to bring more to my PhD data than just my subjective experience. It’s slowly emerging for me that their contribution is as a written record, filtered through the skills of the discipline of anthropology and through the particular skills and experience of Diana, who came along with no background to Teaching and Learning Cinema. Because of this filter, or lens, they do something that the video and audio recordings don’t do (the media archaeologists of course argue that these recording technologies encode very specific kinds of filters on to what we have come to accept as indexically ‘real’). I will get to a discussion of records and what one is. Louise and Laura arrive at the community centre through the wide flywire doors and Louise introduces Laura. Then Lucas arrives and greets Laura. Lou ferries food while Laura cuts cake and makes coffee. Lucas and I have a conversation about ethnography. Lucas: Anthropology and ethnography are different things. Diana: Cultural anthropologists use an ethnographic method grounded in long-term observation in a field setting…I haven’t used this method in a setting like this and am not sure what insights it might bring. Lou suggests that Lucas and I could put out a table. I carry a 4-seater, Lucas carries a 2-seater. Lucas places them as a block and I re-position the tables to form a rectangle. I set up my laptop at the end of the table furthest from the kitchen. Lou places several A2 user’s manuals on the table. Lou is in kitchen cutting capsicum and cucumber strips and unpacking dips. She explains that the dip is made from excess eggplant. Knock at the side door and Louise goes to the door and opens it and Pete enters with filming gear in hand. He and Louise exchange a long hug then Pete and Lucas hug and Lou introduces Pete to Laura. Pete asks Louise whether she has explained to Laura that he forgot the lomo. Louise: yes. Laura: It’s OK. Pete apologises to Laura. Louise says to Pete that she knew Laura would be ok about not having the lomo to film with. Lou introduces Pete to me. Louise explains to me that Pete phoned her before he boarded the train this morning at 630 to say that he has realised he had forgotten the light. I ask Lou what a lomo is she explains that it is a tank. Pete and Lucas talk about how abundant the Urambi gardens are. Lucas asks who wants coffee and pours coffee for himself and Laura and Lou. Pete and Lucas talk about the facility of the community centre for art work. Pete says he has noticed the piano in the other community room and Lou suggests that he could play. Lou places the film camera onto tripod in the doorway. Conversation about bhaba ghanoush dip and how to make. Laura asks Lou how she made it. Lou positions the tripod and camera at the bottom of the room [so that it is capturing the activity at the table]. The film must be rolling, the buzz is audible. Pete asks Lou where filming will be done. Lou says we haven’t decided that yet [as a collective]. Laura removes a large camera from a bag and places it on the kitchen bench top. Pete walks across and picks it up and says it is very nice. I ask Pete directly what term he used to describe the piece of equipment he forgot to bring. It was lomo or [film developing] tank, he says. Lucas approaches the table where I am working and asks me whether I am observing and writing about what they are doing. I say I am but not sure about the meaningfulness of my observations in this context. Lucas says that as a group they have never worked in this formation before and they are just catching up working out what they are doing. So it’s taken me a long time to work out what Di’s notes contribute. This neatly brings me to the time delay in writing this reflection. In the same way I couldn’t understand the significance of Di’s notes when she gave them to me, it’s only now, 10 months later that I’m starting to actually understand what I want to say about art and archives and this business of knowledges of the body. It’s quite simple – I want to say that knowledge of the body is important. Implicit in this is the importance of valuing things we can’t see. But let me say more about the time lag in this blog post. Wearing my records manager’s hat, the time at which the record is made in relation to the event carries weight. The best records are those that are impartial, produced as a by-product of a process. If there’s no process to produce the record, then making the record as close to the time of the event it documents improves its standing as evidence. For example, if there are bullying problems in a workplace, making a diary note straight after the meeting where bullying was experienced will have far more validity than a diary note made 10 months later. TLC’s blog has worked effectively as a record of our work because, thanks to the era of Lucas’ practice using blogs as artworks, notes (mostly by Lucas) have come quick smart on the heels of practice. However, for the archivist, digestion time is critical. In the art of appraisal (deciding what becomes archives), contemporary best practice is sentencing (applying retention decisions) on creation ie you have worked out before hand how long different kinds of records need to be kept and you then have a list of record types and durations for how long they should be kept. In government jurisdictions, this is a key task that government archives carry out–helping government agencies come up with these documents about retention decisions. So the key here is that you have a good holistic picture of what’s going on in the agency so you can make some reasonable decisions about what should be kept and how long for. There are some key principles to this: community expectation (some of my archivist colleagues call this The Canberra Times test, ie if this record is chucked, will it be on the front page), evidential and legal requirements, and what the organisation actually needs to do its business. So as a record, this blog post is way too late. However, here’s the art historical slant–performance studies has an important discussion about whether performance remains or disappears. The timeline for this goes like this. 1993: performance studies scholar Peggy Phelan wrote a book exploring what goes ‘unmarked’ in visual culture, mulling over the value of things that can’t be seen. She asserted that it’s in the nature of performance that it disappears. 1997: art historian-focused-on-performance art, Amelia Jones, pointed out the reality that documentation of performance does not disappear and can be used by people like Jones to talk about performance works made, as she describes, when she was a child (or in the case of Laura, before she was born). This performance studies discussion continues–Rebecca Schneider’s idea about performance as record is one I am still really making sense of … Lucas and I did use her idea to talk about re-enactment as a kind of mini-ritual. Right, let’s get to the point. It’s this. Jones makes obvious that documentation does let us access work from the past. And I have spent the past three days going through our documentation of the work with Laura so that’s my claim that this blog post has some validity as record.